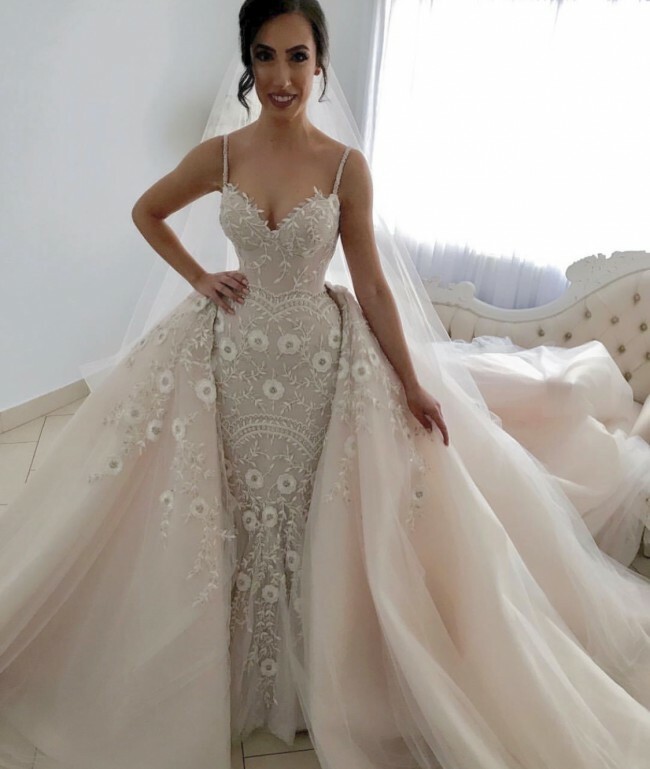 “This was my dream dress and Steven did help me live this dream”. 2017 custom made Steven Khalil dress. Comes with over skirt that is fully detachable. White lace covers the full dress and the skirt lace is covered at the top to mid way. Dress does have a clip that can be clipped up when dancing also a wrist handle around the hand. Dress and skirt has been professionally dry cleaned . Veil has pearls at the top of it. The dress has had two padding included for the extra bust but these can be removed by an alterer. There are two tears in the tual at the inside bottom of the dress due the shoe heel but not noticeable, other than that in great condition. Dress can be purchased on its own without the skirt if not required and price to be negotiated. Dress comes With box as it has been dry cleaned . Skirt is in a large white bag from Steven khalil with tags included.